The postwar Japanese experience has been a counterpoint struggle between the persistent advocacy of a peaceful world, as evident in huge public rallies and in the many levels of personal involvement in peace studies and promotion, on the one hand, and the reckless increase in nations making and stockpiling nuclear weapons in Europe and Asia. Foremost among players in this mounting nuclear crisis is the very nation that first opened the nuclear pandora’s box, the United States. Yet, significant change has recently taken place in U.S. nuclear policy. From 1945 to 1990, the United States produced some 70,000 nuclear weapons of approximately 70 types for more than 120 weapon systems. 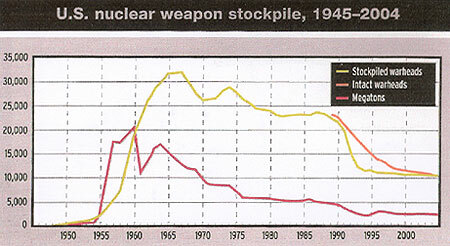 In 1967 the operational stockpile reached a peak of about 32,000 warheads. A dramatic expansion occurred from the mid-1950s to the mid-1960s because each military branch wanted a special nuclear weapon for practically every conceivable mission. In the peak production years of 1959 and 1960, warheads came off the assembly lines at a rate of 27 per day—about 600 a month. The many categories of “need” included various anti-submarine weapons (launched from ships and subs as well as dropped from helicopters), atomic land mines, artillery shells, surface-to-surface missiles in all ranges, air-to-surface and surface-to-air missiles, every size of gravity bomb for dozens of different nuclear-capable bombers, and three-dozen nuclear-capable tactical aircraft. The historic high for megatonnage was reached in 1960 with almost 20,500 megatons (20 billion tons, or 40 trillion tons of TNT), the equivalent of about 1,400,000 Hiroshimas. By 2004, however, the total was down to about one-tenth the 1960 level, or some 2,000 megatons, or “only” 140,000 Hiroshimas. From the 1970s, the military’s appetite for nuclear weapons had slackened, as many nuclear-based operations reverted to use of conventional weapons. The United States has since dismantled approximately 60,000 warheads. For four decades there was a steady rhythm: old warheads were retired and new ones built. The trend ended in 1989, when the Rocky Flats plant in Colorado—where the explosive pits were made—was shut down for safety and environmental reasons. Since then, no new warheads have been produced. The remaining stockpile included warheads for well-known weapons such as the MX and Minuteman III missiles (ICBMs), Trident submarine-launched missiles, cruise missiles, and new or modified bombs. Many of the nuclear weapons had been deployed abroad. The peak deployment of U.S. nuclear weapons in NATO countries in Europe was in 1971, with some 7,300 weapons dispersed in seven countries. In the Far East, the U.S. stored some 3,250 weapons in Okinawa, South Korea, Guam and the Philippines. In 1975, some 7,400 nuclear warheads were aboard various surface and submarine craft in the Atlantic and Pacific oceans, and the Mediterranean Sea. When the Cold War ended, the U.S. stockpile had about 21,500 nuclear warheads. Of these, more than 11,000 were disassembled and disposed of during the 1990s, leaving about 10,400 in the stockpile as of early 2004. Of these, only a few hundred more are slated for dismantling, which is essentially the reverse of the assembly process, except that high explosives used for detonating the nuclear “pits” are disposed of by burning (from 1981 the amount burned annually averaged about 227,000 pounds). Various bomb parts and nuclear supplies have been returned to the primary production facilities (e.g., Honeywell Plant in Kansas City, Pinellas Plant in Clearwater, Florida, Mound Plant near Daytona, Ohio, and the Y-12 plant in Oak Ridge Tennessee). Overall, some 11,751 warheads were dismantled in the decade 1990–1999. The current Bush administration, however, harbors more ambitious plans. Plans for producing new “pits” (the explosive core of nuclear weapons) are underway at Los Alamos National Laboratory, and there are ambitious plans for a new facility capable of producing 250–900 pits annually by the year 2018. The downsizing of traditional nuclear weapons programs outlined above was not due to a devaluing of nuclear power for military use. Quite the opposite: U.S. nuclear operations were shifted to a new theater—nuclear weapons in space. The National Aeronautics and Space Administration (NASA) was developed around a core of German space scientists smuggled into the United States at the end of World War II. The head of this group was Werner von Braun, who had led the development of the V-2 rocket that Nazi Germany used to destroy much of London, Paris, and Brussels. The “core group” consisted of 100 top scientists, though the entire group from the “master race” numbered some 1,500. It hardly seems an accident that the banner over NASA headquarters today reads “Master of Space.” This involves, of course, placement of space weapons so as to have mastery over the earth below. The key to space mastery is a whole new program called Theater Missile Defense (TMD), which uses space stations capable of destroying others’ missiles in their boost phase, that is, before they get up into space. The TMD system has, then, space weapons (including space laser guns) deployed strategically above the earth, with control stations located at strategic places on the earth. The overall system requires naval control ships circling the globe, as well the cooperation of friendly nations for stationing U.S. bases, as in Japan, Korea, and Taiwan for the Far East, as well as various locations in Europe and Central Asia. The long-range goal is control of the entire earth, which includes control of who gets “on” or “off” planet earth with their own space ships. Beyond mastery of earth is a long-range goal of exploration and eventual mining for vital resources on other planets. Of course, trips to other planets take a long time (a year to Mars), though such times can be cut by half if nuclear propellants are used. The drawback, of course, is that expanding the use of nuclear energy in space increases the already dangerous levels of “space junk” adrift in space. It is reported that the “first 1,000 kilometers” of space is already filled with so much “space junk” that adding to it will make future space trips more difficult. There are reportedly some 110,000 pieces of such junk already swimming in space—enough to make 34 plutonium reactor cores. And in the fabricating plants on earth, nuclear radiation has induced many cases of disease and death. A further difficulty is that the space weapons program relies on many satellites that can be easily knocked out. Its operations depend heavily on computerized systems that can go wrong (some already have). On the ground, one serious accident at, say, Cape Canaveral would require removing everything—all exposed buildings, soil, personnel, vegetation, and so on. On the other end of this spectrum, extending the militarization into deep space would require even greater use of nuclear power because it is beyond the range of the solar system. While NASA began as a civil administration, its alliance with military programs has caused its expenses to escalate. So it has turned to the Pentagon for funds, and its operations are now “dual use.” Thus, so much of its funding is now top secret that it operates on a “black budget,” a new seedbed for restricting civil liberties, including citizen rights to protest its program and products. And protest is inevitable if for no other reason than NASA’s program are so costly that all other government programs such as health, education, and public welfare may eventually lose much of their government support.. Thus could a “defense against threats from the outside” trigger an eventual civil collapse within the world’s richest nation. While no world-threatening accidents involving nuclear weapons have yet occurred, there have been hundreds of accidents of varying seriousness. But the U.S. government’s record on public disclosure has been less than forthcoming. 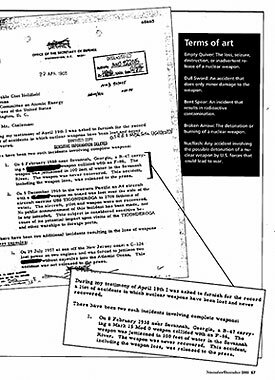 *Sample of censorship of nuclear weapons accident report. (Bulletin of the Atomic Scientists) — click image for enlarged view. Other NATO allies in Europe have been put at risk by nuclear accidents involving U.S. nuclear warheads. On at least four occasions between mid-October 1961 and August 1962, Jupiter missiles carrying 1.4 megaton thermonuclear warheads were struck by lightening; thermal batteries were activated, and in two cases, tritium-deuterium “boost” gas was injected into the warhead pits, partially arming them. 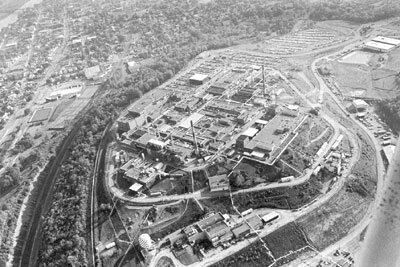 The 1981 list, however, included only cases that had been publicly disclosed and those when radioactive fallout spread beyond the limits of military bases in the U.S. or in a foreign country. Seven of the cases were not reported when they happened, and only 14 were revealed at times when nuclear weapons were involved. Why the Defense Department has yet to acknowledge so many incidents beyond the 32 disclosed in 1981 is a mystery. “Continued and unnecessary secrecy about past accidents only increases suspicion, both within and outside the United States, that other serious accidents have occurred and that there has been undisclosed radiological contamination in one or more of the other countries that hosted U.S. nuclear forces during the Cold War,” wrote Chuck Hansen in the Bulletin of the Atomic Scientists issue (Nov.-Dec., 2000) from which the above, and the following table, are taken. So now, as the planned placement of nuclear weapons in space is reported, citizens at home and abroad are naturally concerned about the need and wisdom of placing “star wars” directly above our heads. Nothing remotely resembling democratic process has been involved in this exceedingly dangerous scheme. How will “incidents” and “accidents” be dealt with, resolved, or removed from the high heavens? The costs are reportedly so high, that many government services which the public has voted into place, and on which we depend for health, education, and an effective economy, may well be sacrificed. Is “mastery of space” worth losing mastery of our own lives?